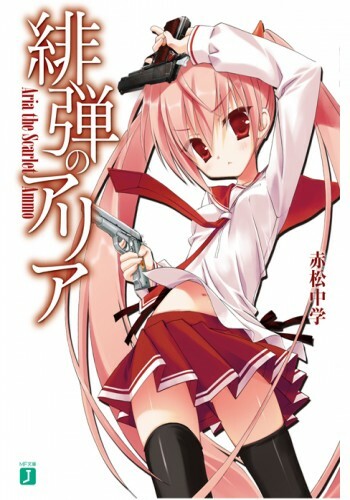 Synopsis: In response to the worsening crime rate, Japan creates Tokyo Butei High, an elite academy where "Butei" or armed detectives hone their deadly skills in hopes of becoming mercenary-like agents of justice. One particular Butei is Kinji Tooyama, an anti-social and curt sophomore dropout who was once a student of the combat-centric Assault Division. Kinji now lives a life of leisure studying logistics in order to cover up his powerful but embarrassing special ability. However, his peaceful days soon come to an end when he becomes the target of the infamous "Butei Killer," and runs into an emotional hurricane and outspoken prodigy of the highest rank, Aria Holmes Kanzaki, who saves Kinji's life and demands that he become her partner after seeing what he is truly capable of. Digital Manga Guild but I'm not sure if they still hold the rights for this LN plus this is a lot volume compare to Bluesteel Blasphemer. The cover is little uh obscene, for most volume cover. I have wanted this one ever since I have watched the anime. Remember, if you really desire license rescues, you must show your support to convince JNC that there is demand in numbers. With regards to series previously licensed, is the reluctance of JP publishers the biggest roadblock? Or are rights issues severe enough that my dumb brain doesn't understand? People overestimate the demand for license rescues. I don't know if I personally want this or no. Someone was saying it's not that good (which again, I try to hold off on judging from something as vague as that) and I don't really like to invest in really long series. But it's just knowing there's a series out there I can only read two volumes of in English legitimately that irks me, lol. It really irks me too. I am sure part of the reason I up-voted this is because that irks me, but I still do really want this. If J-Novel were to get this, they would only be able to get it starting from volume 3 and beyond since the first 2 are still on digital platforms. @legitpancake I think they can still start from Volume one, but they would need to do there own translation. Verticle has Zaregoto. Also, I think going by your logic, JNC would start at like Vol 5 or 6, I think the first 5 volumes were licensed. nvm, I think I just got this idea from how Bak Tsuki does things. @drone205 I completely agree with you both as well. This is on my rescue wishlist next to Full Metal Panic. There most likely quite a few Decent LN out there who were licensed but abandoned for one reason or another when the US market was first developing. This is just an example of that happening. Good or bad, it would be great to have work done to 100% before deciding its not worth it. Given that DMI are still selling it, I assume their license is still current, for the two volumes they released at Any rate. It was be of the first Light Novels I looked at in the Kindle store, and one I rejected due to the relatively high price and poor quality of the sample pages alone. Oh how I've prayed for the day that someone would take this from DMI and do it justice. How I would rejoice if this got picked up by a good English publisher to the point I'd pay double standard e-book prices. Of course that's just me. If DMI have a booth this year at AX like they did the last few, I’ll ask them about the status of this. I expect blank stares, but it’d make me happy to have this resurrected. Maybe now that LNs are bigger business they’d give it another chance? I want to see this series get another English release. I'm also not sure about the current license status with DMI, though I'm assuming it's a contract that lasts for a few years at the very least, so it may just be a case of sitting on the license of a dead project because of contractual reasons or something? Just a reminder that by Christmas the series will have 30 volumes published. Given my name I'm sure it is somewhat obvious that I have a bit of extra desire for this. I know that it was licensed, but didn't really get much progress. @shiroi-hane It depends on what the licensing agreement entails. Did DMI get an exclusive license or did they just get a license to distribute without an agreement that no one else can get a license to distribute it in the same region? If I remember correctly from Sam's explanation, a lot of licenses J-Novel gets don't give them exclusive rights so some other people could technically purchase a license as well. However because J-Novel does such a good job I doubt someone would want to license anything they license because they would be competing with J-Novel's speed, and reliability. Which I think would be a bad decision. @malloc Licensing is on a per-volume basis, and those are exclusive licenses. Sam said that the Japanese publisher could license later books of series he has rights to to a different company, but that would not only hurt future relations with that publisher, it wouldn't even be worth it, since later volumes don't sell near as many copies as the first volumes. And with how long and rather unpopular this title is, I see Sam getting DxD before it. Yeah, the issue with rescues and such is that you'd likely have to first buy the license from the current license holder for the NA releases with the JP publisher in the loop, THEN buy the future licenses (Basically, you'd need to renegotiate the licensing with both the original publisher and the translation publisher). It really wouldn't be worth it from a business perspective. Would it be nice? Yes. Likely? No unless the company with the license goes defunct completely. Then things can get really tricky. (Take Geneon for example. When they went bankrupt, a lot of titles went into limbo for a while). The only way I see this getting licensed is if JNC pulls another Rokujouma. But the fan translation is stalled at volume 14... So that's probably not happening. @legitpancake I may have been wrong about J-Novel's licenses however a license by definition is not necessarily exclusive. All a license is, is permission to use their copyrighted material per the terms contained in the license agreement. There may be other parts of the agreement or not. My main point is that not all licenses contain an exclusivity clause and we shouldn't make assumptions. Did you know that when you buy computer software, you actually are purchasing a license to use that software not the software itself. The license may come with other things like disks that contain said software unless it is a digital only purchase. If all licenses were exclusive then a company could only sell 1 copy of it's software. Also some licenses have a date when their license runs out so even if a company that purchased an exclusive license goes out of business, often you can just wait for the license to run out before trying to get a license for it. If only we had some stars left to wish upon. It really depends though. Like I know some companies can be tricky and word their license agreements so that they have the license indefinitely. There are even some companies that go as far as to screw over the person that made the original product/novel/etc. Like one company would word their license agreements so that you could ONLY write for them and they'd have full ownership of all your work. Now, I'd assume that publishers would know better than to fall for such tricks, but the point is that like you said, there are many different types of licenses and we don't really know. That said, Japan tends to have some standards, like with Voices for characters, that basically are never broken whether or not there is an explicit agreement or not. "Unpopular" kinda seems like a bit of a stretch, given that some titles JNC has put out are kind of obscure, at least as far as I can tell. Not to mention, Aria has enough of a following here to have carved out a sizable fan translation (regardless of it's status now). I believe the fans are there, though I think the DMI releases failed because they released the first two volumes at the wrong time, back before the Light Novel license boom caused by SAO (among other titles) really got going. If it had been licensed now, I'm sure more people would have at least given it a chance. Another factor I think played a part in DMI more or less dropping the series is nobody who would be interested in the light novels likely had ever heard of DMI. I can personally attest to that, because prior to DMI acquiring the license, I had never heard of DMI. So basically, I think the series is "unpopular" due to basically not releasing it here during a more opportune time (like maybe when Aria AA was airing, or when light novel awareness was higher than it was in 2013), and the fact that DMI is, at least to people like myself, a relative unknown in the light novel community. Perhaps the Digital only format hurt it a little too, but I doubt that since JNC is mostly digital only, and seems to be doing fine. I'd take DxD too, and do expect it to get a license before Aria gets "rescued," but I'd rather have Aria, since it caters more to my tastes.